Here's an idea for a potential future layout in the Farthing series. 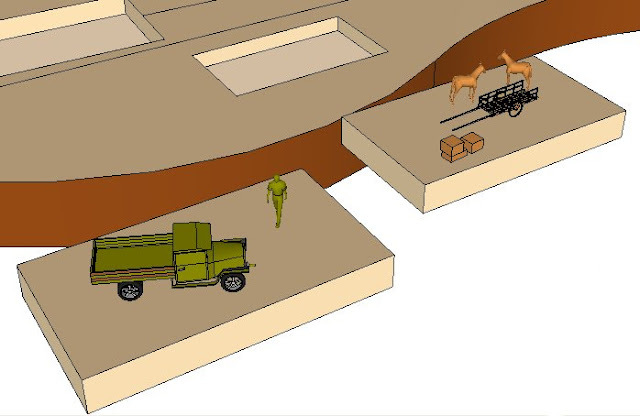 The idea is to show a small section of the goods yard at Farthing. The trackplan is based on a real-world prototype, namely an interesting ladder of kick-back sidings in Gloucester Old Yard, which served a variety of purposes. By focussing on one end of the track ladder, the layout can feature a variety of stock movements in a limited space, while still following the prototype. Above is an OS map showing Gloucester Old Yard (as of 1936, hence past the 50 year copyright date). Goods depot on the left, engine shed on the right, and lots of sidings in between. Lovely! Here is the map again, after I’ve been at it with my crayons! As you can see, the red headshunt in the middle served a variety of interesting facilities (is headhunt the right word in this case? Americans would call it the lead, I think). This included the coaling stage, and a yard where the loco department deposited ash and stored the occasional loco. The engineers also had some special vehicles in these sidings, including an inspection saloon with its own carriage shed. 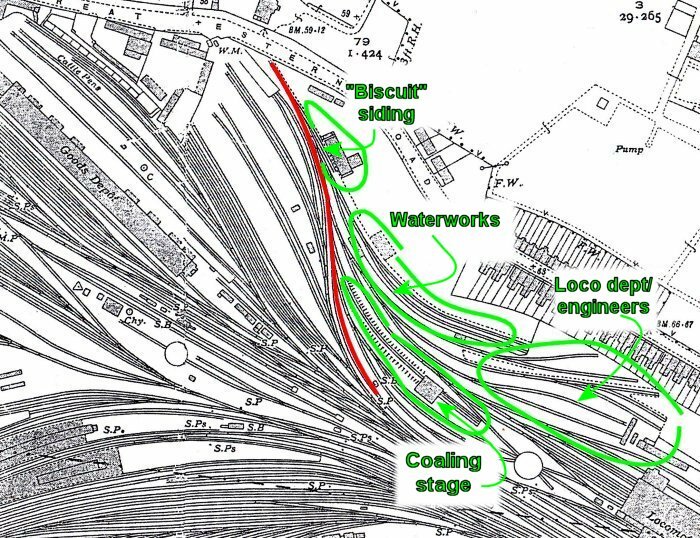 The sidings also served the Gloucester water works, and a private goods depot used by, among others, a biscuit company. 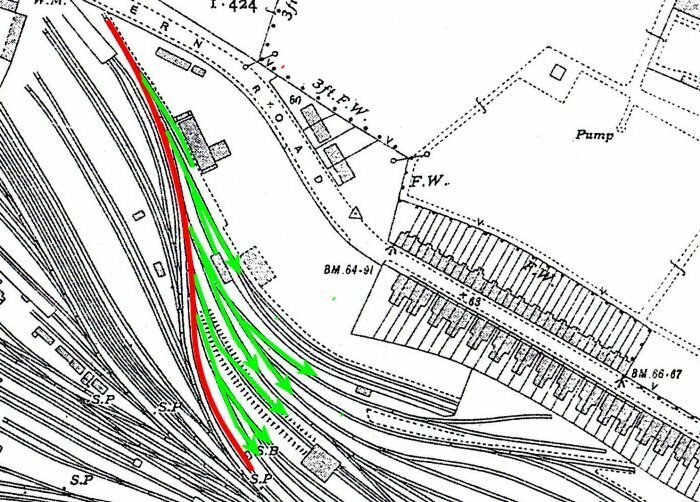 Here’s a close-up, showing how all sidings to the right of the headshunt were effectively kick-back sidings. Consequently, trains had to be propelled/drawn almost to the end of the headshunt to access the sidings. Two locos worked the sidings: The yard pilot and the shed pilot. Looking at photos I also noticed that by the late 1940s an additional point had been provided linking the headshunt in question with the mileage sidings (not visible on this 1936 map, but drawn in here). 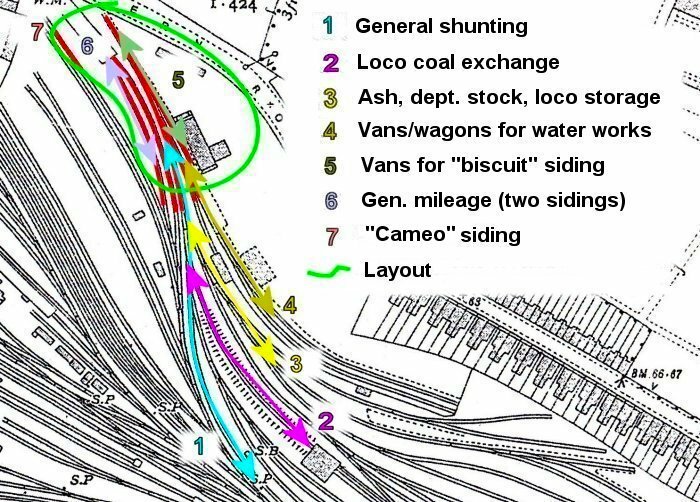 This included the two sidings seen here in green, which led to an end-loading dock and seem to have featured a good variety of vans and mineral opens. So how does all that translate into a small layout? Well the idea is that the layout will feature just the extreme uppermost part of the yard, as indicated here with the green outline. The rest of the yard is represented by an off-scene fiddle yard. The plan above illustrates the variety of stock and moves that can be justified on the layout. For 1-5, trains are drawn back/propelled into the headhunt (and hence onto the layout) before being moved into the relevant siding (ie back off-scene). Movements of the Loco Coal wagons were especially interesting: They were exchanged between the yard pilot and the shed pilot. The two mileage sidings (6) provide for a bit of general shunting (edit: and coach stock storage, see below). The small section of track (7) is a scenic indication of the rest of the mileage sidings. Apart from the shunting, there could be a few interchangeable cameos/dioramas to indicate the passing of the day in a yard. See the “flexible layout” idea. I am playing with the idea of setting the layout in 1947, which would be a departure from my normal Edwardian timeframe. EDIT: On reflection I have decided to stick with the Edwardian period. 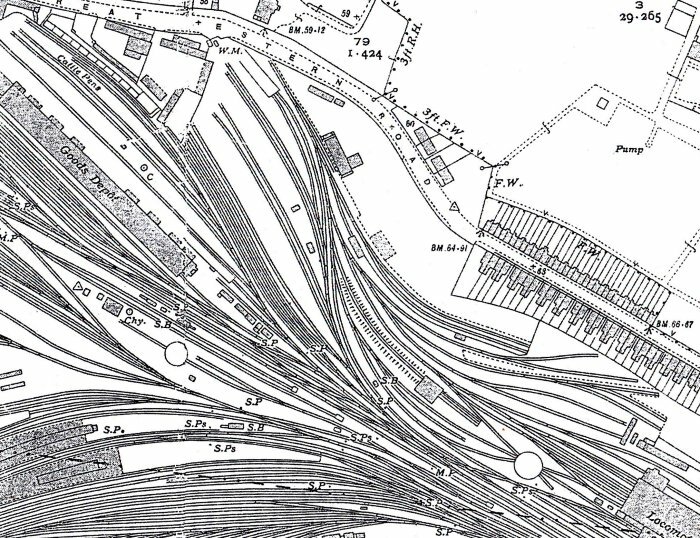 An OS map from 1902 suggests that the trackplan displayed above was largely similar around the turn of the century, give or take one or two sidings. Note: Much of the inspiration for the layout comes from an article in GWRJ No. 45, which describes operations in Gloucester Old Yard. If I have misunderstood something (including terminology) please don’t hesitate to correct me. Original image here. "You may, print, display, and store for your personal use at home and you may copy to a blog or personal web page as long as the page is freely available with no login restrictions and no charges." Edit 2: Since writing this post I have decided to stick with my Edwardian timeframe. The above post has therefore been lightly edited to avoid confusion.